I have stated that while I don't believe that the stock market has made its final cyclical top, we are in the late stages of a bull market (see Risks are rising, but THE TOP is still ahead). Nevertheless, psychology is getting a little frothy, which represent the pre-condition for a major top. Mid-week market update: As we wait to see if the stock market can break either up or down out of this narrow trading range, this week has been a light week for major market moving economic data, However, there are a number of political and non-economic developments to keep an eye on. 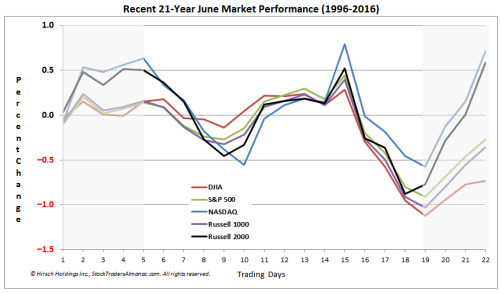 Despite my recent negativity (see Risks are rising, but THE TOP is still ahead and Things you don't see at market bottoms, 23-Jun-2017 edition), I am not ready to throw in the towel on this equity bull market. 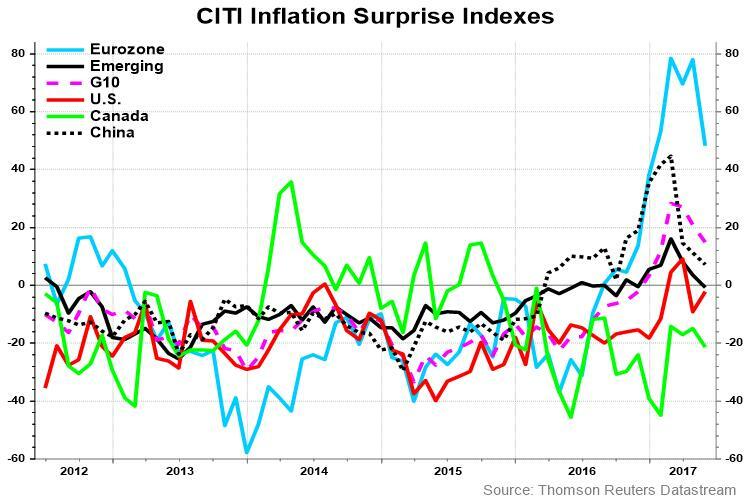 From a long-term perspective, the reflation trade is still alive, and growth is global in scope. As the 20-year monthly chart below of the Dow Jones Global Index (DJW) shows, the last two tops were preceded by negative RSI divergences. 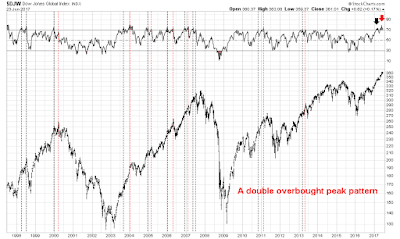 So far, DJW is barely overbought and has not even had the opportunity to exhibit a negative RSI divergence. This suggests that global equities can continue to grind higher, and the ultimate top is, at a minimum, several months away. The tactical outlooks suggests that there may be some near-term weakness ahead. Drilling down to the weekly chart, DJW has shown a pattern of flashing double RSI overbought sell signals. In the past, the index has achieved a first RSI peak overbought reading (dark vertical line) which was followed by a second RSI peak (red vertical line). 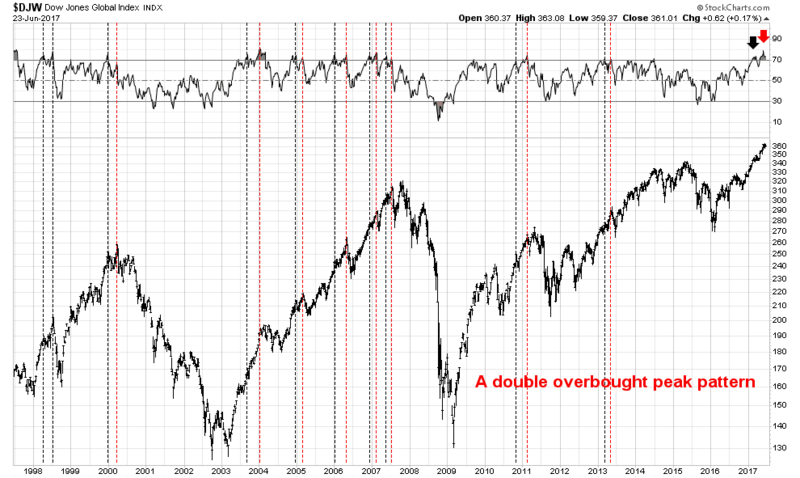 DJW has recently shown the same double overbought peak pattern, and, if history is any guide, the market is likely to stage a minor pullback. I interpret these technical conditions as being in favor of the global reflation trade, though some minor pause may be necessary. This scenario is consistent with current macro and fundamental readings that are supportive of a reflationary driven equity advance..
Mid-week market update: Technical analysts monitor market breadth, as the theory goes, to see the underlying tone of the market. If the major market averages are rising, but breadth indicators are not confirming the advance, this can be described as the generals leading the charge, but the troops are not following. 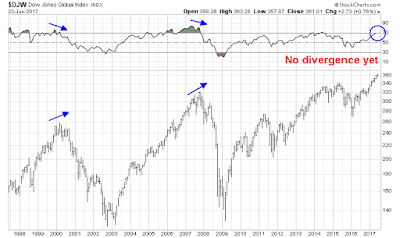 Such negative divergences are signs of technical weakness that may be a precursor to future market weakness. I have been highly skeptical of breadth indicators as a technical analysis tool because breadth divergences can take a long time for the market to resolve, if at all. The chart below shows the SPX, the “generals”, along with several indicators of how the “troops” are behaving, namely the mid-cap and small cap indices, as well as the the NYSE Advance-Decline Line. The behaviour of these indicators during and after the Tech Bubble was problematical. 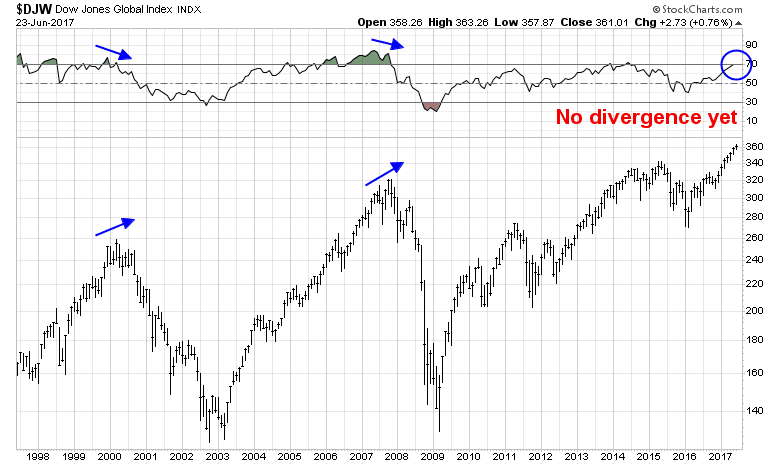 During the advance from 1998 to 2000, the NYSE A-D Line fell and flashed a negative divergence sell signal. At the same time, both the mid- and small-cap indices continued to rise and confirmed the market advance. 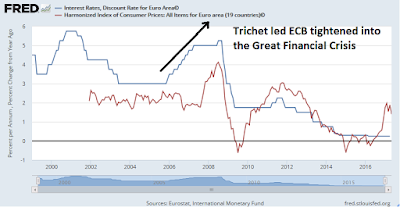 Which divergence should investors believe? After the market peaked in 2000, the mid and small caps traded sideways, which represented a non-confirmation of the bear market. Investors who followed this buy signal would have seen significant drawdowns during this bear market. To be sure, there were periods when breadth indicators worked. The NYSE A-D Line traded sideways during the market decline of 2011, which was a buy signal. As well, it correctly warned of market weakness in 2015. Putting it all together, the report card for these indicators can best be described as inconsistent and the timing of the signal uncertain. At a minimum, no investor would use breadth indicators in a trading system. I believe that I discovered a solution to the problems that technicians struggle with when they use breadth indicators. 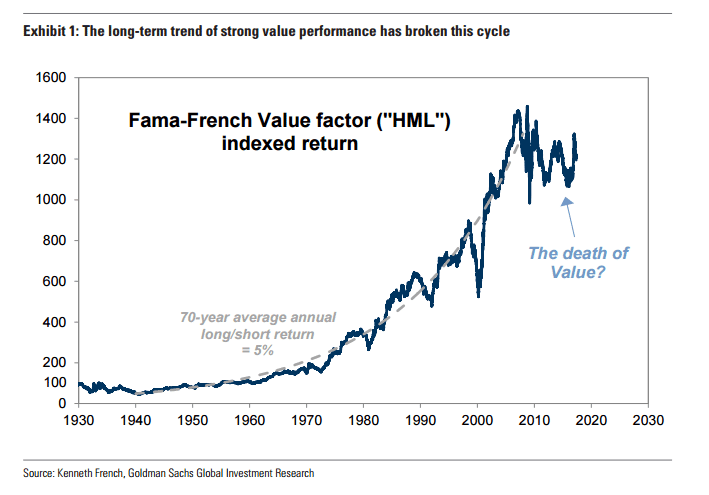 Recently, Ben Snider at Goldman Sachs published a report entitled "The Death of Value", which suggested that the value style is likely to face further short-term headwinds. 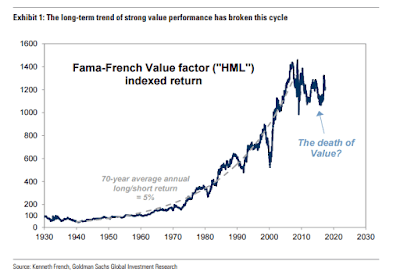 Specifically, Snider referred to the Fama-French value factor, which had seen an unbelievable run from 1940 to 2010 (charts via Value Walk). Goldman Sachs went on to postulate that the value style is unlikely to perform well because of macro headwinds. 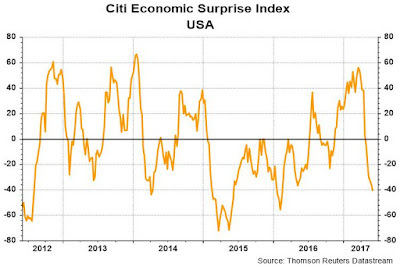 This style has historically underperformed as economic growth decelerates. However, the investment implications are not quite as clear-cut as that, based on my analysis of how investors implement value investing. Four steps, where's the stumble? Wall Street traders know about the "Three steps and a stumble" adage, which states that the stock market tends to suffer substantial setbacks once the Fed takes three tightening steps in a row. 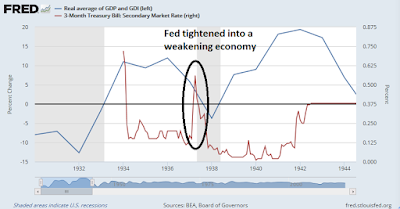 Now that the Fed has raised rates four consecutive times, where`s the stumble? 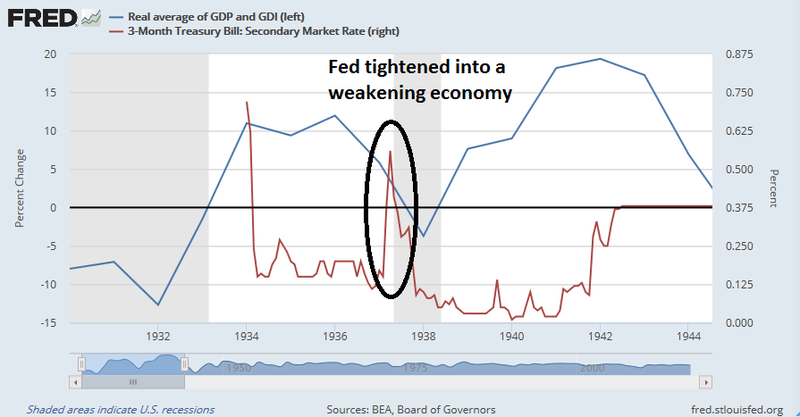 Despite my recent post which suggested that the odds of a hawkish rate hike was high (see A dovish or hawkish rate hike), my social media feed was full of misgivings that the Fed is in the process of making a serious policy error like the 1937 rate hike cycle, where the central bank tightened the economy into a recession. 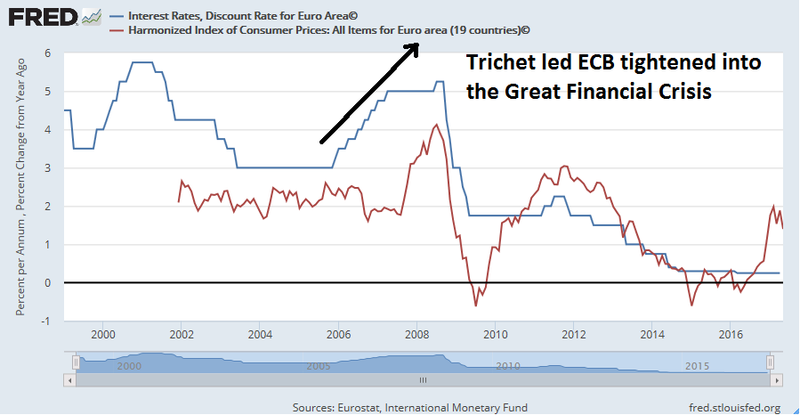 Another policy error that occurred in recent memory is the Jean-Claude Trichet led European Central Bank's policy of tightening into the Great Financial Crisis. Similar kinds of concerns are rising today. There are preliminary signs of a weakening economy, and the Fed's willingness to stay the course on its rate normalization policy in the face of soft inflation statistics is raising anxiety levels. While I believe that recession risks in 2018 are rising, my base case scenario still calls for one last blow-off top in stock prices before the equity party comes to a close. 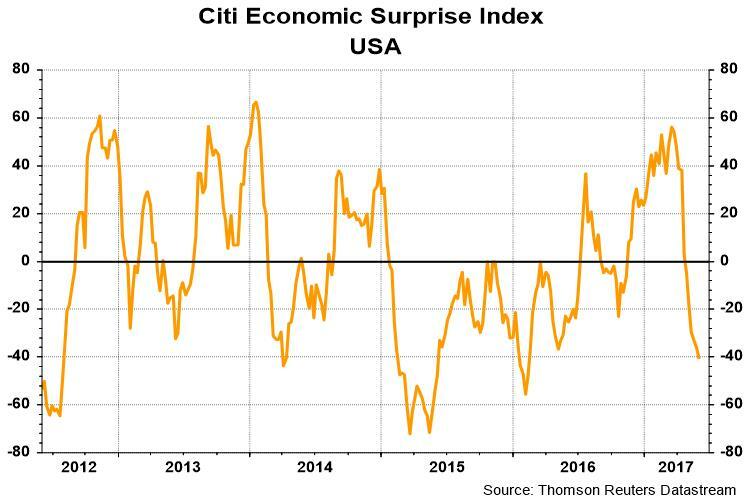 Current concerns about the Fed tightening into a weakening economy can be summarized by this chart of the Citigroup US Economic Surprise Index (ESI), which measures whether macro releases are beating or missing expectations. As the chart shows, ESI has been weak, and the 10-year yield has declined in sympathy. But ESI is already at very low levels. How much worse can the macro picture get before it rebounds? 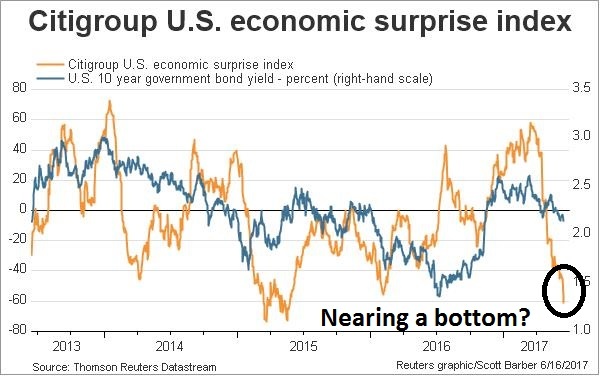 More surprises from the Fed? 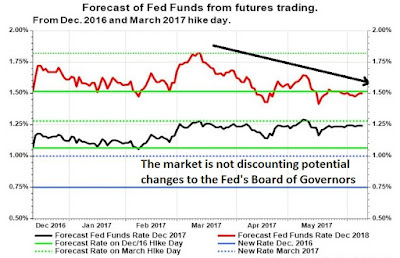 In my last post, I suggested that the odds favored a hawkish rate hike (see A dovish or hawkish rate hike?) and I turned out to be correct. However, some of the market reaction was puzzling, as much of the policy direction had already been well telegraphed. Under the subordinated balance sheet approach, once the change in reinvestment policy is triggered, the balance sheet would essentially be set on autopilot to shrink passively until it reaches a neutral level, expanding in line with the demand for currency thereafter. I favor an approach that would gradually and predictably increase the maximum amount of securities the market will be required to absorb each month, while avoiding spikes. Thus, in an abundance of caution, I prefer to cap monthly redemptions at a pace that gradually increases over a fixed period. In addition, I would be inclined to follow a similar approach in managing the reduction of the holdings of Treasury securities and mortgage-backed securities (MBS), calibrated according to their particular characteristics. The only details that were missing were the exact numbers of the caps. Further, there are no discussions about active sales from the Fed's holdings, which was also not a surprise. 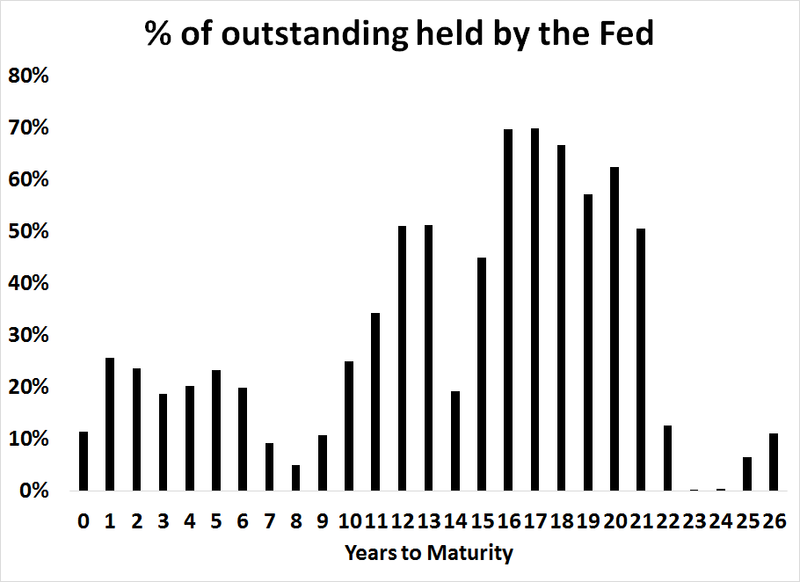 The Fed's gradual approach of allowing securities to mature and roll off the balance sheet means that investors who are watching the shape of the yield curve will not have to worry too much about Fed actions in the long end that might distort market signals. 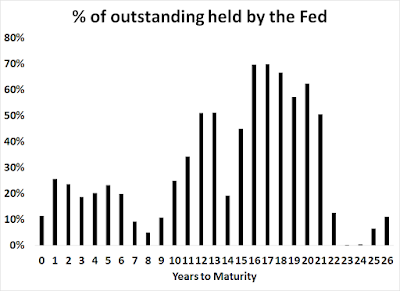 This chart, which I made from data via Global Macro Monitor, shows that the Fed holds an extraordinary amount of the outstanding Treasury issues once the maturity goes out 10-15 years. These facts are all well known to the public and therefore the Fed's plans for normalizing the balance sheet should not be a big surprise. 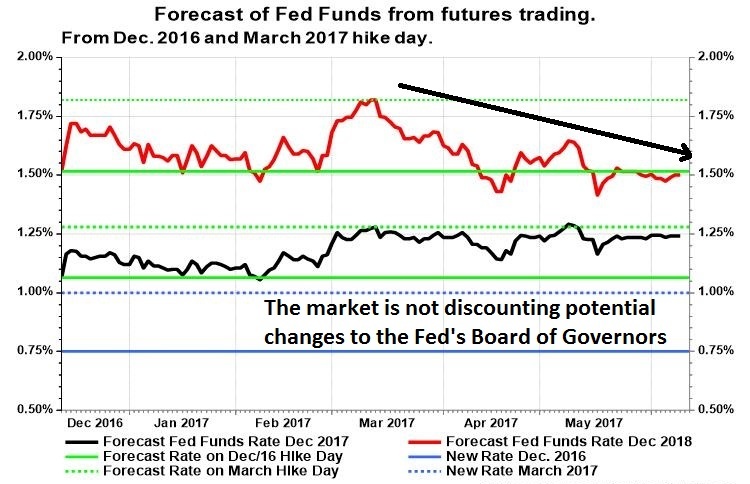 A dovish or hawkish rate hike? Mid-week market update: I am writing my mid-week market update one day early. FOMC announcement days can be volatile and it's virtually impossible to make many comments about the technical condition of the market as directional reversals are common the next day. Mark Hulbert suggested to wait 30 minutes after the FOMC announcement, and then bet on the opposite direction of the reaction. For what it's worth, Historical studies from Jeff Hirsch of Almanac Trader indicated that FOMC announcement days has shown a bullish bias and the day after a bearish one. The Fed has signaled that a June rate hike is a virtual certainty. The only question for the market is the tone of the accompanying statement. 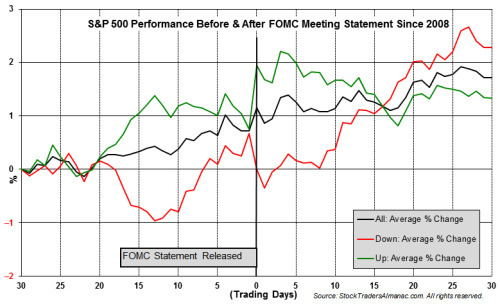 Will it be a dovish or hawkish rate hike? Despite expectations that the Fed may tone down its language because of tame inflation statistics, there is a case to be made for a hawkish rate hike. Ed Yardeni may have top-ticked large cap growth stocks last week by postulating that a melt-up may be underway, led by the FAANG names. As the chart below shows, FAANG as a percentage of SPX market cap has been rising steadily for the last few years and now account for 11.9% of SPX market cap. Despite the air pocket that these stocks hit on Friday, the relative market performance of the NASDAQ 100 still looks like a blip in an uptrend. The relative performance of the Russell 1000 Growth Index compared to the Russell 1000 Value shows a higher degree of technical damage, but the relative uptrend of growth over value stocks also remains intact. Looking into the remainder of 2017, however, there is a potential threat to earnings growth that investors should keep an eye on. A Fed preview: What happens in 2018? Marvin Goodfriend for Fed chair? Almost all analysts expect a rate hike this week, even though inflation has fallen further below the Fed's target. A few key questions are: Does the FOMC see the dip in inflation as transitory? Will the Fed keep tightening if inflation stays below target? Will the next tightening step be another rate hike or balance sheet normalization? Those are all good questions, but as the market looks ahead to the FOMC meeting next week, it's time to look beyond what the Fed might do at its June meeting, or even the remainder of the year. The bigger question is how the Fed reaction function might change in 2018 as the new Trump nominees to the Board of Governors assume their posts. Another key question to consider is whether the Trump administration plans to keep Janet Yellen as Fed chair. As there are three open positions on the board, and there are three rumored nominees, any potential new Fed chair would come from the current list of new appointees. Of the three, the most likely candidate is Marvin Goodfriend. Current market expectations show that December 2017 Fed Funds (black line) to be relatively steady, but December 2018 Fed Funds (red line) have been declining. Regardless of whether Goodfriend becomes the new Fed chair, I examine this week how the influence of the three likely appointees may change the path of monetary policy in 2018 and beyond. Mid-week market update: So far, the stock market seems to be following Jeff Hirsch's seasonal map of June. The market was strong in the first couple of days, and it has mostly been flat this week. If history is any guide, it should start to weaken late this week. 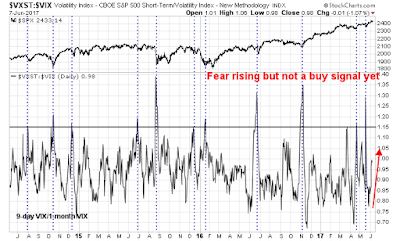 Evidence is building that of a volatility spike ahead. 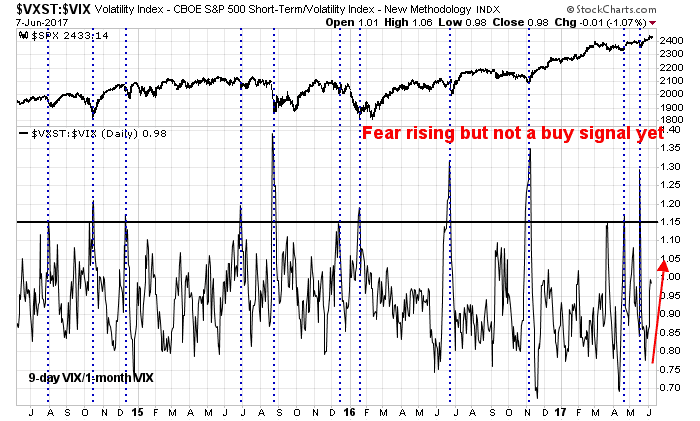 As volatility is inversely correlated with stock prices, rising vol therefore implies a stock market pullback. The chart below of the ratio 9-day VIX (VXST) to 1-month VIX (VIX) shows that anxiety is rising, but levels are nowhere near where past corrections have bottomed in the past. Indeed, there are a number of binary events coming up. Thursday will see the ECB meeting, the UK election, and the Comey testimony before Congress. Next week is the FOMC meeting. No wonder the 9-day VIX is rising. Exhibit 1 shows that the standard deviation of excess returns has trended lower for U.S. large capitalization mutual funds over the past five decades. The exhibit shows the five-year, rolling standard deviation of excess returns for all funds that existed at that time. This also fits with the story of declining variance in skill along with steady variance in luck. 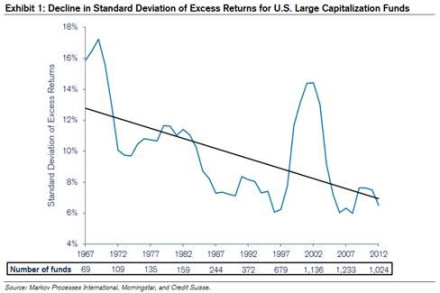 These analyses introduce the possibility that the aggregate amount of available alpha—a measure of risk-adjusted excess returns—has been shrinking over time as investors have become more skillful. Investing is a zero- sum game in the sense that one investor’s outperformance of a benchmark must match another investor’s underperformance. Add in the fact that in aggregate investors earn a rate of return less than that of the market as a consequence of fees, and the challenge for active managers becomes clear. I got into quantitative investing back in the 1980`s when ideas and models were fresh and plentiful. Today, factor investing has become increasingly mainstream, and so-called "smart beta" may have exceeded their best before date. And an undershoot in inflation expectations has caused the market to re-assess the probability of the "thrust and bust" scenario. In particular, the decline in inflationary expectations has been global in scope, though the US (red line) has stabilized. Friday's release of the May Jobs Report is a typical example of the weak macro theme. Not only did headline employment miss expectations, employment for previous months was revised downwards. Even though a June rate hike is more or less baked in, the big question is whether the Fed is likely to pause its rate normalization policy in light of disappointing inflation and growth statistics.